In the perilous dawn of the Fifth Age, power - and survival - often depends on a hero's sharp sword and stout shield, wielded with determination and skill. * Roles for warriors, such as the mercenary, the rogue knight, and more! 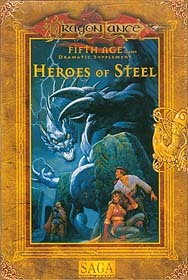 Also in Heroes of Steel is The Rising Storm, an adventure that sets in motion an epic struggle for the dominance of Krynn: Dragons of a New Age. The heroes' journey to uncover the new threat facing Ansalon can link with events in the DragonLance: Fifth Age novel The Dawning of a New Age, by Jean Rabe. A beautifully illustrated full-colour poster map details western Ansalon, which the heroes explore in their quest. Whether a Knight or a mercenary, war-sorcerer or yeoman, Krynn needs the strength of its warriors to conquer the Evil abroad in the Fifth Age.